protests after Secretary of State Rex Tillerson accused the country of carrying out the “ethnic cleansing” of Rohingya Muslims in the state. 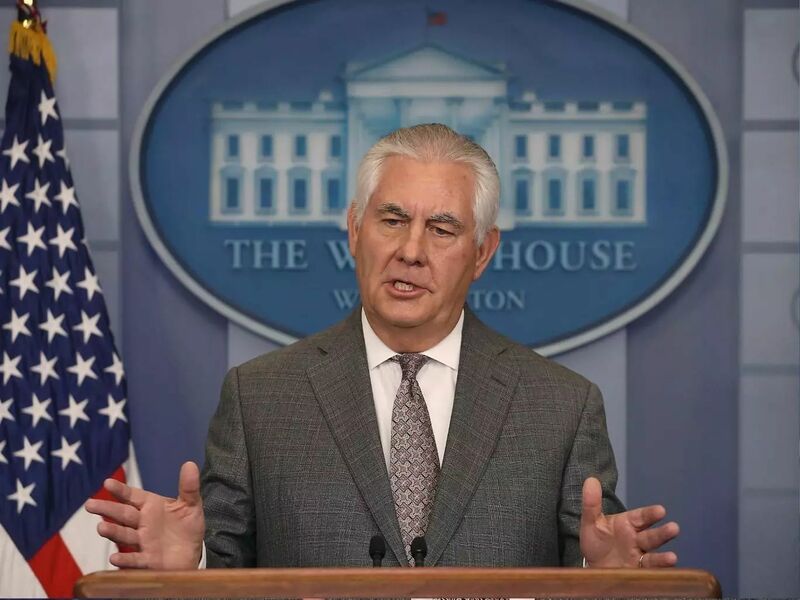 Tillerson threatened penalties for military officials engaged in a brutal crackdown that has sent more than 620,000 refugees flooding over the border to Bangladesh. Although the designation carries no legal obligations for the US to act, Tillerson said those who perpetrated the atrocities “must be held accountable.” He added that the US wanted a full investigation and was considering “targeted sanctions” against those responsible - but not broader sanctions against the nation. Rohingya from Burma's Rakhine state have been fleeing to neighbouring Bangladesh, seeking refuge from what Burma's military has called “clearance operations.” The crisis started in August, when Rohingya insurgents attacked Burmese security forces, leading to a brutal crackdown in which soldiers and Buddhist mobs have killed men, raped women and girls and burned homes and property to force the Rohingya to leave. The declaration followed a lengthy review process by President Donald Trump's administration to determine whether the violence met the threshold to be considered ethnic cleansing. The United Nations (UN) came to that conclusion in September, but the US had held off, with Tillerson saying he needed more information even as he expressed deep concern about the crisis. Last week, Tillerson travelled to Burma in the highest level visit by a US official since Trump took office. US officials dangled the possibility of an “ethnic cleansing” designation ahead of Tillerson's trip, potentially giving him more leverage as he met with officials in Burma. In the capital of Naypitaw, Tillerson met with the country's civilian leader, Aung San Suu Kyi, as well as Burma's powerful military chief, Min Aung Hlaing, who is in charge of operations in Rakhine state, home to Burma's Rohingya population. The leader of a group that works to improve conditions for the Rohingya said on Thursday he hopes the declaration will strengthen the call for accountability. Arakan Project director Chris Lewa said he thought Tillerson's visit had been relatively appreciated and he hoped it would prove constructive. Senior State Department officials said the determination was intended to ramp up pressure on the military and others in Burma to resolve the conflict and repatriate refugees who have fled to Bangladesh. Yet it was also likely to intensify calls for the Trump administration and Congress to move toward new sanctions. Earlier this month, a House committee passed a nonbinding resolution condemning “murderous ethnic cleansing and atrocities” and calling on Trump to impose sanctions on those responsible for abuses. Yet sweeping sanctions targeting Burma's economy or its military as a whole are off the table, officials said, adding that the Trump administration had determined they would not be productive either for ensuring accountability or for promoting broader US goals in Burma. Instead, the US is considering sanctions against individuals only, said the officials, who weren't authorised to comment by name and briefed reporters on a conference call on condition of anonymity. Broad-based US sanctions on Burma were eased under former President Barack Obama as the South East Asian nation inched toward democracy. US officials have been concerned that slapping back sanctions or pushing Burma's leaders too hard on the Rohingya violence could undermine the country's civilian government, led for the last 18 months by Suu Kyi. That could slow or reverse the country's delicate transition away from decades of harsh military rule and risks pushing Burma away from the US and closer to China. Human rights groups accuse the military of a scorched-earth campaign against the Rohinyga, who numbered roughly 1 million in Burma before the latest exodus. The Buddhist majority in Burma believes they migrated illegally from Bangladesh, but many Rohingya families have lived for generations in Burma. In 1982, they were stripped of their citizenship. Already, the United States has curtailed its ties to Burma's military over the violence. Earlier this year, the US restored restrictions on granting visas to members of Burma's military, and the State Department has deemed units and officers involved in operations in Rakhine state ineligible for US assistance.